I meant to blog yesterday, but as usual for the first full day in Tucson, I hit the Gem Mall running, overshopped and under-hydrated and ended up with a killer headache. You have to have water with you ALWAYS as it's very dry here and we Canadians are just not used to that. Now that I've been coming here for several years and have learned the lay of the land, so to speak, I can cover the territory much more quickly. The Gem Mall and the neighbouring Holidome are two of the larger shows in Tucson and I use them as a sort of 'home base'. The first day, I went to 1/2 dozen of my usual vendors. With these people, I don't need to waste time negotiating. They point me towards their newest and most interesting stuff, hand me a big basket and are quick to take my filled basket and hand me another empty one. At most wholesale-only shows, nothing has prices on it or if it does, they will be retail, per strand, or MSR prices. Once I've gotten what I want from that vendor, I leave a business card with the pile of baskets/bins and I'm off to the next vendor. I'll go back in day or two and pick up the stuff. That way they have time to add it up and make up an itemized invoice. After 2 days of shopping, I have to say that there are a lot fewer buyers this year, fewer even than last year. Some vendors are gone, several others are trying new venues in an attempt to get a different crowd of customers. In some ways, this is a good thing because a lot of the fly-by-night vendors have flown. But there is still a lot of kitsch around. Everything from gaudy to gorgeous, from tacky to terrific. There's even more tables of "Chinovski" than there were last year. Tomorrow is going to be some "me" time, in a Busman's Honeymoon sort of way. I'm taking a course in rivetting at Swarovski in the morning to learn how to set chatons and the beautiful large fancy stones. Oh yeah, then there's the Interweave magazine (Beadwork) tomorrow night at the Tucson Art Museum. Great chance to meet up with friends and scout out potential teachers. 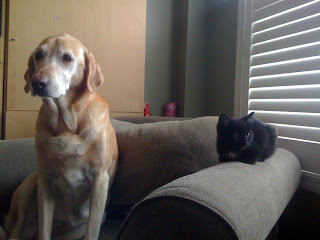 Hopefully by tomorrow I'll also be able to incorporate some pictures into my blog. I just got a new phone last week. It takes pictures, of course, but I haven't learned how to get them off the camera and into my computer yet. Clasps. So many different kinds of clasps - does it make a difference what kind you use? Yes, you betcha! Although there are many possibilities, each style has it's own strengths and weaknesses that make one a better choice than another, depending on how you are using it. Clasps fall into the general category of "Findings." Finding is that big category of general "stuff" that you need to make jewelry that is not the actual jewelry part itself - so ear wires and clasps and headpins and earring backs and ... stuff. So I've heard - they are called "findings" because traditional goldsmiths made them up out of the left over bits and pieces after making the main piece of jewelry - so from the stuff they "found" on their bench. Not sure if that is true - but it makes a good story. Clasps can be broadly divided themselves into four or five main categories, with some specialty clasps in some minor categories. I say there are four traditional types of clasps, and then there are magnetic clasps - which have become somewhat more complicated over the years, as their styles expand. But still - a magnet is a magnet. The four are: Hook-type (Hook and Eye), Box type, Toggles - and Spring-type. Let's look at some examples. A hook and eye clasp is blindingly simple. It is, in some variation or another, a loop and a hook. These vary from th e utilitarian to the whimsical, from plain to elaborate. Some are even so cleverly designed that it is hard to tell that it is a clasp at all! You can even make them yourself using wire and wrapping it. Where to use: A hook and eye is an excellent choice for a necklace. It is secure enough for a necklace, and is easy to do up and undo behind you without being able to see what you are doing. It is, generally, a poor choice for a bracelet - as the hook and eye clasp tends to be long, and will take up a lot of the relatively short design of a bracelet. My experience with them is that they tend to come undone spontaneously in bracelets too. Hook clasps come in an endless variety of sizes, shapes and metals and to suit every budget. Box-type clasps. I love the box-type clasp. It is called this because it is essentially, a small, constructed, shallow box, four sides, and a top and bottom, with a slot that a springy lever slides into. They seem very traditional to me, and tend to be somewhat more expensive than other clasps, mostly because of their more elaborate construction. Often - they have some interesting design on them, or a stone or pearl mounted on the top. 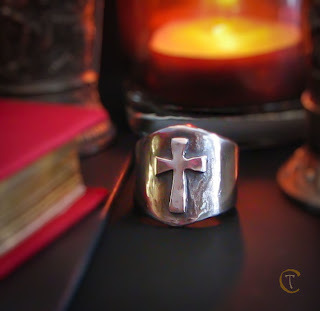 Because they are more complex, they have tended to be made of the more expensive metals, Sterling Silver, Gold-filled, Vermeil - but we have seen a few made in brass or other inexpensive metals in the past few years. I particularly love matching the clasp to either the colour or the theme of the piece I am making, and sometimes use this style of clasp as the inspiration for the piece, or hunt specifically for the one that will match the item perfectly. Sometimes, this little indulgence can add significantly to the cost of the finished piece, but hey - I'm worth it. This hissing cat clasp is one of those "inspiring" clasps. In fact - there is an awesome emerald-green stone clasp that is currently "in processing" that I can hardly wait to build a "something" around. Necklace, bracelet - not sure yet - but there is gonna be green! It is also frequently easier to find multi-strand clasps in a box clasp. Where to use: They are overall, comfortable to wear, and work well for bracelets and necklaces. They can be fiddly to do up as a bracelet, especially if the lever mechanism is a tight fit, but once you hear the "click" - they are secure. To open them, squeeze the tab and pull the v-shaped lever out of it's little hole. Sometimes, over- enthusiastic squeezing will deform the v-shape into one that does not have enough spring to secure it. This is an easy fix. Gently wedge open the v-shape again - I usually just slip something narrow like a nail file into the gap and widen it slightly. Don't over do it - you can break the metal. Sometimes, they have a little safety bar - like these with the Lapis cabochon - that swings out and over a little post - just to add an extra level of security. A "belt and suspenders" approach to security. Next week - we'll carry on - with toggles and magnetic and other odd and speciality clasps. By the way - all the images above are clickable links to the items shown. Metal Clay Play day is a fun day filled with people with a love of metal clay. It is a chance to use all the fabulous metal clay tools that find their home at BeadFx and to socialize (if you wish) with other like minded folk. It is often a chance to get inspiration or learn a trick from a fellow artist. Here are some pictures of what some of us were up to today. She found that the clay was quite elastic and this was hard to get used to. Christine came with some great tools and ideas. Here she is working with a clamp on magnifier. Also Christine came with this great can of Olive Oil!!! Hmm...I never had thought about buying it that way. Valerie made a lot of great things. Here she is making a really neat wavy square/diamond shape. For some reason I didn't get any pictures of Kathleen. She did some fun things and even worked with her silver paper clay. Also she brought her olive oil in a pump contained that sprayed like a can (I remember I used have one and I think it was called a Misto). Sorry, I was having so much fun. I didn't get a picture. Sandra, made a linked copper bracelet!!! 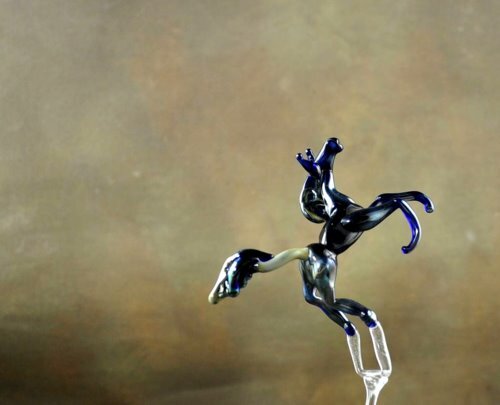 Our own Dwyn has been making some fabulous lampwork horses recently - every now and again she'll share up a pic of one of her creations on facebook. I asked her to share some of them with you this week. I've been making horses all my life - from mathbook doodles to glass beads - my love of horses has been drawn across my life. After years of making my images more and more realistic - it can be hard to let go. I want to capture the essence of the horse and our feelings as they thunder by. Like a cave painter with a blackened stick, hands red with clay - fashioning an image to be viewed with awe in the flickering firelight - so too do I try to make horses that seem to leap and dance, to run and kick and jump so high they seem to fly. I recently became fascinated with and inspired by those early cave drawings. I love to wonder what the artist thought as they made them - and the stories that were told about them. Stories and art are inextricably linked for me. I imagine those cave paintings were the launching points that started the stories flowing. Cro-magnon mass media entertainment - "Come children - listen while I tell you of many moons ago, when a magical horse danced through fire and saved the world." After a decade of making lampwork beads - moving to lampwork sculpture has also been a significant challenge - but liberating too! It's fun to not have to deal with the constraints of wearabilty! In that regard - letting go has been easy! And now - woefully inadequate compared to the above ... lol! I'm still working on my bracelet from last week - it's been a busy week though, and all I've managed to get done is cut out the rest of the rings, and punch out the circles. Nothing has been soldered yet - let alone filled with resin. Last week we talked about the importance of keeping all receipts AND entering them into some sort of spreadsheet or system. If you do this on a regular basis it’s really not a big deal and can save you HUGE amounts of both time and money. So why do so few businesses do this? Why is the blogosphere full of crafters moaning about how far behind they are? Why? Because they don’t run their office properly. This is especially true for part-time businesses. So many part time people don’t really think of themselves as a business and so they fail to run an office. Even if you only sell at one craft show a year, have a handful of online sales or just sell to friends you are running a business. As soon as you have sold a single piece of jewelry you are legally running a business. So since you’re running a business why not make it a successful one? If you don’t take your business seriously no one else will either. Whenever you sit down in your office make use of your time. If you have allocated one hour a week for office work and your paperwork only took five minutes, then use the rest of the time to brainstorm ideas or make plans. Do some internet research and check out some craft shows. Find cheaper suppliers. Check out online sales sites such as Artfire or Etsy. Design a new website and research hosting plans. Jot down some notes for your marketing strategy. Work on your business plan. Play with your income statement, what would happen to your bottom line if you added a craft show? Check out possible stores to sell at. This is the time to work ON your business. A well-run office will take care of itself and you won’t end up in huge mental stress when faced with a pile of receipts and no idea where you stand. That leaves more mental energy for the fun stuff, like making, which is after all the point of all of this isn’t it? Back tomorrow with Inspiration Friday. As I'm sure many of you know. The Tucson Gem and Mineral Show is not just 'one show'. The show itself lasts a couple of weeks, and takes up just about every tent/hotel/motel in the city. It's massive. Bead shows, gem shows, wholesale only, open to the public - you name it. People worldwide flock into Tucson starting the end of January. Hopefully, Marg will get a chance to blog from the show! It's not even February yet, and some of the classes are already filling up. So sign up now while you still can. 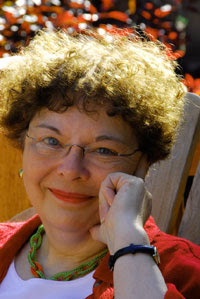 Diane Fitzgerald, jewellery designer and author, is teaching 4 workshops at beadFX in March. I'm super excited and I know a lot of you are too. Her designs are amazing and she's an awesome teacher. If you're like "what the heck? I didn't know about this" or "who's Diane Fitzgerald? ", see details below. P.S. Don't panic. If you really want to take the classes and you're thinking "jeez, all these Swarovskis must cost a ton", you're right, they do. But for this class ONLY, you'll be getting a special price. It's a sweet deal! So - you want to make jewelry? Welcome to our world, little frog - it's a big, wonderful place, full of colour and passion and choices. Many, many choices. First, we are going to talk about "stringing." It is probably easy for you to guess that by this, we mean threading beads through their holes onto some sort of long, thing stringy stuff and tying a knot. Yes indeedy. That's it. You now know how to make jewelry. Go away now, and let the master rest. What - you don't think that is the all and the whole of it? Very wise little frog you are. Hmmmm. I will tell you a story. Once upon a time, many, many grandmothers ago, someone found a shell on the beach. And the wind and the water and the rubbing of the sand had made a hole in it. And someone picked it up and said, "Whoa man, is this ever cool!" And then, someone else said, "Hey, I found one too, and mine is cooler than yours," and the next thing you know, everyone is down on the beach looking for cool shells with holes. Because even though all those people owned was a fire-hardened stick and the latest in genuine leather clothing, they knew the value of a cool shell when they saw it. And when they had their hands full of shells, and couldn't figure out how to carry any more of them, their mother stopped mending their ripped leather leggings and took a piece of leather, cut very thin to make a cord, and put all the shells on it, and tied a knot, and hung it around their necks. And the shells made a pleasant sound as the rubbed together when they ran. And at night, they sat around the fire and the shiny surfaces glinted in the firelight and looked magical. And they made up stories about the shells, and the people who wore them. And it was good. Fast forward to today - we are still putting shiny stuff on string and hanging it on our bodies. I'm pretty sure it's now hardwired into our genes. But we've come up with a few more choices than shells with holes and leather cord. Many, many choices. But I am not going to overwhelm you with them today. This is an excellent beginner's choice, as it is not too thick, not too thin, strong, won't change colour, resists wear, doesn't kink (unless you really work at it), and is a neutral color. It's is, in the words of the immortal philosopher, Gholdi Lahks, "Just Right." You are going to make a bracelet. The standard size for a bracelet is 7 inches, end to end. Here is a secret. You are making it. It doesn't have to be standard. If you are a tiny little slip of a thing with delicate wrists - 6 inches or 6.5 might fit better. If you are a woman of substance that would have made Rubens reach for his paintbrushes - you might prefer an 8 inch bracelet. If you are a dude, and are looking for something showy for the next gala opening - 9 inches might suit better. 7 inches is an AVERAGE. And, just to complicate things - if you pick out thick beads - you need to make the bracelet longer, because when you curve it around your wrist, the thickness of the beads will take up space and make it shorter. Now, you need some beads. Hoo boy. Not even I can make this easy. Here's the store - go pick something out. Here are some projects from our inspirations pages that are simple, stringing projects. OK - got some ideas now? If I am making a design that I have made before, or it is a simple design and I don't have to worry about whether it will "work" or not, like the "Midnight Toast" bracelet above, I will simply unspool (but not cut) about 10 inches of the beading cable, string the beads on the cable, attach one half of the clasp, and then cut the wire, and attach the rest of the clasp to the other end. If I am playing with the design, however, or not sure what order the beads or the colours should go in, then I cut the piece of beading wire, and start my design from the middle - adding beads on both sides to keep the design balanced, once I have figured out what order they should go in. This often involves trying a few beads together, maybe changing the order and trying again, taking some off and changing them around, until I get something that "feels right." "Would I wear that," I think? If the answer is "No," I try again. Be generous when you cut the wire. If you are making a 7 inch bracelet, don't cut 8 inches of wire. Leave at least 4 inches on each end, sometimes more. (I can hear the horrified gasps from here.) This is because bending the beading wire around and stuffing it back into the crimp bead (more on that in a bit) to attach the clasp can be fiddly work, and it is waaaay easier if you have lots of cable to grab. Life is short - don't make it hard for yourself. After the beads, you will need crimps, which are the do-hickeys we use instead of knots to fasten the beading wire, and a clasp. There are lots of choices in crimps, but this is a good starting point. For that matter, there are lots of choices in clasps. (We have, at this moment, 653 different clasps.) This one is inexpensive, durable and a classic design. As to getting the crimp on, and the clasp - I could blather on about that - or you can watch the video here, because seeing is much easier than reading a description. And that - fundamentally - is it. A necklace is just a longer bracelet. Oh, sure, there are different styles of clasps. You can do multiple strands. There is an incalculable number of ways to combine the various beads. But that, little frog, is stringing in a nutshell. Go forth and create jewelry. Next week - I will talk about the types of clasps. Here are some links to useful tips we have published. We keep this list up-to-date here. Fixing it when the crimp comes undone and you don't want to re-string the entire necklace. Cork Clay is a mouldable form of cork that can be used to create forms to cover with metal clay. I use cork clay to help make hollow forms when making syringe forms or if I am making a sculptural piece. I have spoken about using cork clay with syringe in a previous post about syringe metal clay. Mould your shape out of cork. Make sure you cork is completely dry before you add the metal clay. Cork clay is dried best using an air dry method this takes longer than 24 hours and is dependent on the size of the cork and the humidity in the environment. Some people use dehydrators or hot plates to speed up the drying but this can more often cause the pieces to distort and crack. Art Clay World suggest the you dry using heat around 200F and suggests to fill cracks with more cork and to sand or file the piece when it is done. Personally I don't worry about sanding and I just shape my clay to the piece. Once your cork shape is dry you can apply your metal clay. Firing Pieces With Cork - First, torch firing is not recommended with cork clay. I recommend kiln firing with some modifications. A big issues with firing cork clay(or any combustible core) with metal clay is a risk of melting. Sometimes, especially if you have a lot of cork to burn out, the process of burning the cork will suddenly raise the temperature in the kiln about he melting point of your clay. This may cause your piece to MELT!!!! SO, when firing pieces that include cork clay you must accommodate this possibility or you may end up with a melted piece. What I do is: I ramp my kiln to 800F then hold the pieces for 15 minutes (to allow the cork to burn out) then I ramp my kiln to the firing temperature I want (usually 1600F) and hold as long as I want (usually 2 hours). Another important point to remember is that you should have good ventilation (as with all metal clays) when firing cork clay, I know several metal clay artists who are irritated by the fumes from firing the cork. Primarily I have used cork with silver metal clay. I have to experiment more with other base metal clays. (I will be trying some cork and FAST FIRE BRONZE next week. It’s January and the blogosphere is buzzing these days with posts of taxes owed, forms to be filled out and lots and lots of moaning and groaning about piles of receipts to be entered. It appears that very few people keep up to date with their bookkeeping, I admit, I too was behind by about 4 months. (as of today I’m caught up, wooohoooo!) Around September things in my wee business just got really busy and entering those little pieces of paper into a spreadsheet became very low on my priority list. When faced with the choice of making beads or jewelry, updating my facebook site or dealing with bookkeeping guess which choice wins? Keeping track of all your receipts is one of those icky little chores that is critical to your financial well being. If you sell $1,000 of jewelry Revenue Canada (or the IRS) sees $1,000 of income and will tax you on that full amount. You however did not make $1,000. You bought the materials to make that jewelry. You paid online shop fees or craft show booth fees. You bought packaging to put the jewelry in and envelopes to mail it out. Of that $1,000 you probably made $700. You need to make sure you do not pay income tax on that $300. In the 27% income tax bracket, tax on $1000 is $270. Tax on $700 is $199. You save $71. If you sell $10,000 in a year, the tax saved is $710 in our example. This is where the all-important receipt comes in. EVERY single business expenses must be backed up with a receipt. No receipt, no deduction. While you do not submit your receipts with your tax return you are legally obligated to keep your receipts for 7 years. If you are audited you must produce receipts backing up every expense claimed. A lot of people misplace receipts for small amounts and then think, well, it was only $5, no big deal. You’d be surprised how those small amounts add up. If you don’t keep that $5 receipt 4 times a month, that’s $20 a month of expenses you are missing. That’s $240 in a year, at the 27% tax rate that’s $65 extra income tax you will pay. No matter how small the amount, keep that receipt. For those who are collecting HST/GST/PST (depending on the province) your receipts have another purpose. Every cent you spend in HST/GST/PST is refundable. Again, no receipt, no refund. You’ll be amazed how fast the amount of tax you pay adds up. If I spend $5,000 in expenses in a year then in Ontario my HST paid is $650. I want that back. Keeping the receipt is the first step. Entering the amounts into a system is the second step. In a small or part-time business it is not cost effective to pay someone to do your bookkeeping. A simple spreadsheet is all you need to track your own expenses. Break your receipts into meaningful categories and simply enter the receipt amounts. When it comes to filing your tax returns it is definitely better to have a professional accountant complete yours. Personally I would rather focus on making jewelry than on learning the ins and outs of tax laws. An accountant will charge less if you have already input all your receipts and can just hand them the numbers. I recommend tracking your expenses monthly. It’s much easier to remember what you spent 2 weeks ago rather than 10 months ago. And if you have misplaced any receipts you won’t find them in a years time. My process is simple. I have a manila envelope on my desk and I put all my receipts in there. Weekly I dig through my wallet and purse looking for stray receipts. Once a month I sit down and print out any electronic receipts (such as phone bills). Then I break my receipts down into categories and enter them on an Excel spreadsheet. Once a receipt is entered I put a checkmark on it and stick it in another envelope. That envelope goes into a box for storage. Voila! This week, I have a partial inspiration for you. The project I chose is going to take me more than a week to finish, as I just didn't have the time available to get everything done. This was a little paint play I did with daughter last weekend. She was painting, so I started painting as well - this was my first time putting a paintbrush to paper since I was a kid ;-) I love the colours though. I haven't yet quite decided whether to shrink down this image, and use cut outs of it - or to just use the colours. We'll see, and hopefully all will be revealed next week. Here are the components (or one little section of them) the idea is to make an entire bracelet. These will be soldered and linked - then filled with resin. With luck - I'll have this completed for next friday. Send us your stuff - We'd love to see what you're working on! We all get into a creative rut every now and again, and I think this happens more to those of us that create for profit. We try to create things that we know will sell, and that is pretty much a surefire way to smother out any creative sparks that may have been on the verge of igniting. At least that's the case for me! I'm always trying to come up with ways to reignite that creative spark within me. Personally, I have so many other things that are more pressing - that trying to come up with new designs, or just allowing myself the luxury to play has been difficult. 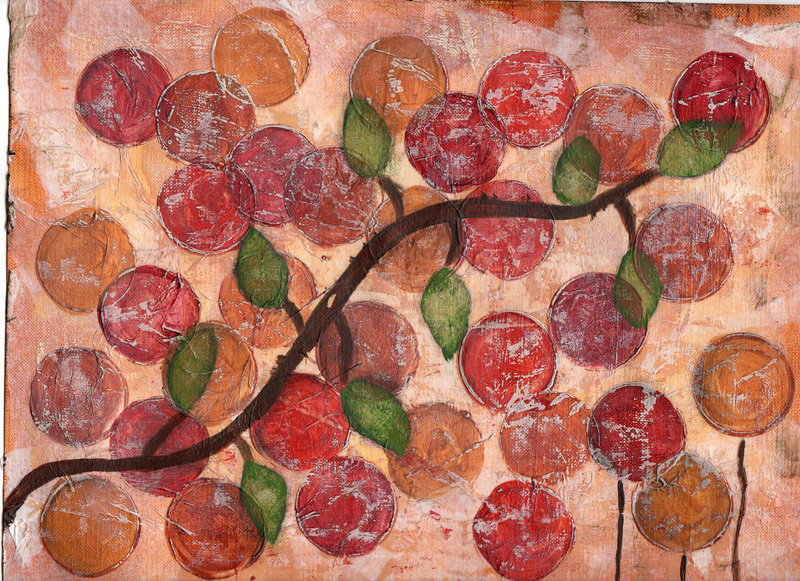 I've recently become entranced with the idea of keeping an art journal. The idea is to make a page (daily preferably) that will inspire you. The great thing about art journals is there there are no 'rules'. It does usually contain illustration, combined with text. It doesn't have to be your illustration - cut pics from magazines, design and photography blogs, flickr, anything that will inspire colour, texture, form - anything. Remember, this is a personal art journal - you're not selling it. You most certainly do not need to consider yourself an 'artist' this is a journal - yours. Show it, or not show it off. That's up to you. Get yourself a sketchbook, start with a prompt of some sort, be it a picture, a word/phrase, or even a colour, and go from there. Once you've completed your page - look at the imagery, and colours. Can you think of ways to to incorporate what you just made into jewelry? Chances are, this will get your creative juices flowing. No idea where to begin? Of course there are a ton of Flickr groups for Art Journals - I love flickr! These two should get you started. I was going to be brave and show mine...but I just can't. My little drawings and doodles look childish, and a little silly with mushroom houses that look an awful lot like the pigs from Angry Birds - ;-). Will it inspire some new jewelry? Maybe, maybe not, but I did feel like I accomplished something creatively ..and it was lots of fun. We've had some very positive feedback on our question of the month which is "What do you think of our inspirations - our weekly projects? Hate 'em? Love 'em? Ignore 'em? Never heard of 'em? If you haven't - check them out here: InspirationsFX"
Most of you 'love em', a few ignore them, and no one has actually come right out and said they hate them - whew :-) The one criticism we have received is that there usually isn't enough information for folks who are newer to beading to figure out the process on their own. More instruction is required. We're listening! Further to Dwyn's post on Monday regarding coming up with a series of blog posts that are more instructional. We are planning on adding more info to our inspiration posts to make them more informative for you. This will be an evolving process, and we'd love feedback from you as we post them. We try to keep the inspirations reasonable, in terms of the amount of time we spend making, writing, photographing, and posting them online. So, another call out for your input! We'd really love to hear about what you need help with, what you want to learn, and what information was missing before. Feel free to post anonymously! I'm happy to announce that Stephanie Dixon is back - with a few new classes too. On March 5, Stephanie will teaching (one-time only) the Embellished Business Card Holder. Also new, is the Crystal Adventure Necklace on March 5th. But you don't have to wait till March to make all that blingy stuff. This weekend, Jan. 23rd, try the Crystallized Bling Ring with Stephanie. Another instructor returning this month is Lezlie Winemaker. Lezlie will be teaching with us till March 2011, so look out for her classes on our monthly calenders. Next weekend, Jan. 29 & 30, she'll be doing a 2Day Lampwork Beading Workshop. During this intensive weekend, various decorative techniques including surface decoration, sculptural, clear casing, and pulling cane skills will be covered. Finally, Heather Bell Denison a.k.a finesilvergirl is hosting this month's Play Day. Sign up today if you're interested in messy fingers and banter. How to make jewelry = What kind of jewelry do you want to make? Always, we get emails and people coming into the store, who come and tell us: "I want to make jewelry, where do I start?" And we always respond with, "What kind of jewelry do you want to make?" because, "making jewelry" is a really big topic. A macramed, hemp friendship-bracelet and the crown jewels of England are both "jewelry" - but the techniques to make either one are decidedly different! So, we're going to start a new series of blog posts that tackle "How to make Jewelry for the Complete Newbie" - but we'd like some input from you, dear readers - especially any newbies that come across this post - but also those who want to expand into new areas. Joy of Metal Clay: A new product! 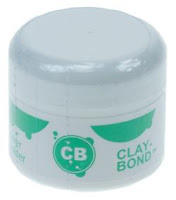 I recently read about a new product (at least new to me) called clay bond. Hmmm...interesting but what does it do? The powder is mixed with water to make a paste, that it is brushed (with a stiff brush) on to the piece where you want to make a join. The paste will dry and will form a bond that holds the piece in place. Then the piece is fired embedded in activated carbon. I will have to try and get my hands on some and experiment. One great possibility I see for this is to help repair some of the base metal clays as some of them do repair very easily. Has anyone tried this??? Any comments? When I get my hands on some I will let you know what I think. As I sat down to write this I had planned on beginning a series on the joys of bookkeeping. The series will be talking about the fun of tracking expenses, the joys of bank reconciliations and the sheer wonderment of profit and loss statements. Bet you can’t wait! Just as I was about to begin my eyes fell on my calendar, and I realized, hey – it’s January 15! I have a craft show application due today (the show is next November)! ARGH! Good thing I looked at the calendar and an even better thing that I had written that deadline down. So I shall defer the bookkeeping for another week to talk about craft shows and deadlines. Most of us are still in holiday recovery mode however now is the time to pull together your craft show applications for 2011. Are you planning on doing a craft show in 2011? It’s a hard decision if you are in the beginning stages of jewelry making to think about what you’ll be doing next October but now is the time to think. Even if you’re not sure, take some time now to do the research. Many shows have their applications available now even if the deadline is in April or May. The first thing to do is find out about shows. In Ontario the best place to look is in the Ontario Craft Council’s online publication – CraftSource. Most provinces/states have a crafts organization that publishes a list of shows. If you’re in the USA check out Sunshine Artists magazine. Another good source of shows is to look at artists you admire and look at their websites. All of us have websites where we list the events we participate in. Fortunately almost all show organizers now have websites where you can download the application. Applications are free, go ahead, check out a whole bunch of them. Even if you aren’t sure about doing a show it’s always good to know about them for future reference. Once you’ve made a list of shows, download all the applications. If an application is not yet available make a note on your calendar when you can get it. When you have your applications write the application deadlines on your calendar so you don’t miss one! Here’s a couple of insider tips. NEVER do a show that is not juried. A juried show means that someone has looked at your photos and checked to make sure your work is handmade. A non-juried show is any old crap that someone wants to sell and you can bet some of it is made in third world countries. As a handmade artist you cannot compete with third world work so make sure you’re in a show with only other handmade work. A juried show also has quotas, meaning that the show has a good variety of work and is not 100% jewelry. ALWAYS send your application in as fast as you can, don’t wait until the deadline. Jewelry is one of the hardest categories to get into due to the high number of applicants. Just because a show has a deadline of March 31 doesn’t mean that your category is still open until March 31. Besides, the faster you get your application in, the faster you get that task off your to do list. Create a standard application kit for yourself. Decide which photos you will use, write your resume (craft only), and other items you’ll need and keep them all in one place. This way when you get an application all you have to do is print out the kit and pop it in an envelope. Get the BEST photos that you can. Digital cameras are really cheap now so there’s no excuse for bad photos. If you’re photos are lousy invest some time reading the manual for your camera and some time learning how to take good shots. Your 5 – 10 images are all an organizer has to judge your work on, make them shine. There is no formula for image shots but there are some basic rules. Use a plain coloured background, preferably white. This isn’t about showing how artistic a photographer you are, it’s about showing what you make. Do not crowd the shot, each image should be of 1 or maximum 2 pieces. Make sure the whole shot is in focus. Label each photo (on the back) with your name, company name, name of the piece and what it’s made of. Everybody reading this blog should sign up for a show in 2011, even if it’s just a one afternoon event in a church basement. If you start planning for it now you’ll be totally organized and ready when it arrives. 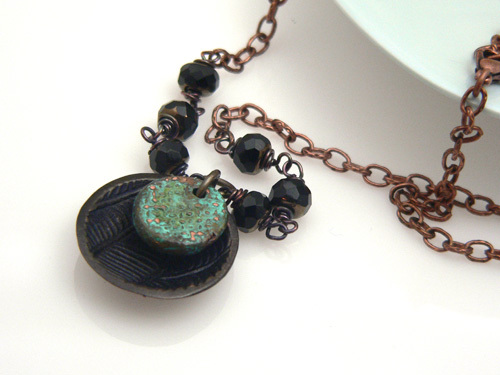 The pendant components were created from copper clay with two different patina applications. The verdigris finish is obvious, but the black one underneath was blue at one point. The spray varnish I used turned the patina quite dark. A hint of blue is noticeable in real life though - slight, but it's there. Until next week - Happy Creating! Last chance for Inspiration Friday! I've got an insanely busy day ahead of me - so just a quick eye candy post today. Quick for me to post at least. You'll want to brew up a pot of tea before checking this one out! Rachel Nelson-Smith is a highly talented seed bead artist. Be sure to check out her gallery of designs. She's also got a DIY section if you want to download any of her projects! So you've learned how to do the peyote stitch, what's next? Here's a class where you can learn how to create your own peyote patterns and adjust patterns. 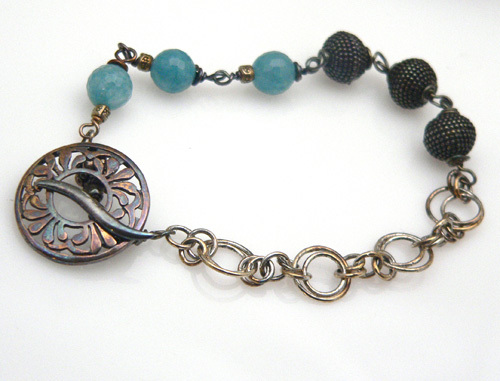 This is a cool mixed pattern necklace: semi-precious stones, seed beads, chain, coiled beads - all in one necklace. And hey, who says you can't add your own? This wireworked bracelet calls for precision and detail for a beautiful finished look. 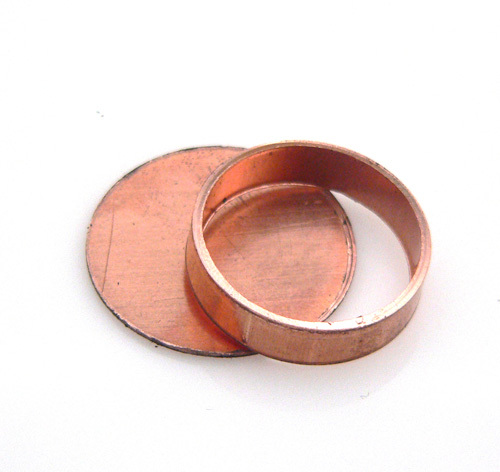 Try it in Copper, Argentium Silver or 14k Gold Filled. There are more classes next week. See them here. Here's what I've done so far...Spent 20 minutes clicking 'surprise me' on the smitten kitchen blog, because of course caramelized shallots have 'everything' to do with beading and jewelry. :-) I then got distracted by a link on facebook which took me to the amazing artwork of Wesley Flemming. Be sure to have a look through his gallery. Incredible glass insects!! I then somehow ended up on wikipedia - gah - beetles, moose, and siberian tigers...Like I really needed to look up those "right now" sigh. Headed to Tucson? Check out the Swarovski show. Tucson is Mecca, Mecca for bead and gem enthusiasts that is! For about 4 weeks at the end of January, beginning of February, Tucson becomes THE place to go to shop for beads, gems, stone beads, exciting new findings, tools (old and new), hot new products, - in short - just about everything you could desire. New product lines are launched. Never before seen gemstones are introduced. Old ones are re-visited. You should go at least once in your life! You'll be overwhelmed with the beady goodness! One of the shows you might want to make a point of checking out is the Swarovski "Create Your Style" show. Feb 1 - 4 - they will be presenting classes and demos, and the show is open to the public. In addition, they are doing a series of "Sparkling Make and Takes. "I don't have a list of all of the Make and Take Projects, but I can tell you about 4 of them - because we designed them and donated the kits. First up - Brave Heart. 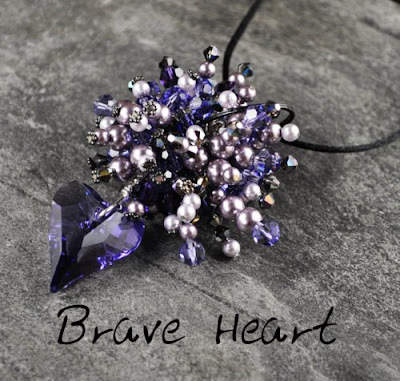 Showcasing Swarovski's Wild new Heart design, and accenting it with pearls and crystals - this delicious pendant is surprisingly fast and easy to make. 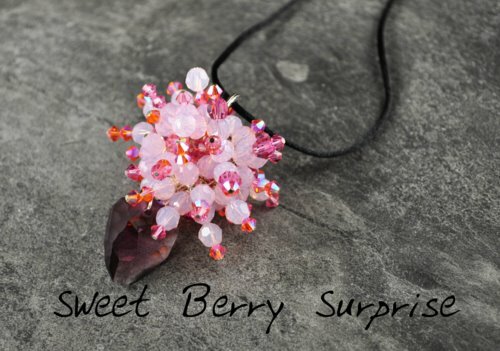 Sweet Berry Surprise. An explosion of berry goodness - yummy "Rock" eye-candy and sweet Rose Opal and Orange crystals. Here come the Tucson Sun. Sun worshipers will rejoice in this Helios crystal - glowing with the heat of the southern sun, and accented with fiery* crystals.What a great souvenir of a warm escape from the winter this would be! Spring is around the corner - can't you feel it coming? This is the Zen of Spring, with two colour choices, Water, and Growth. 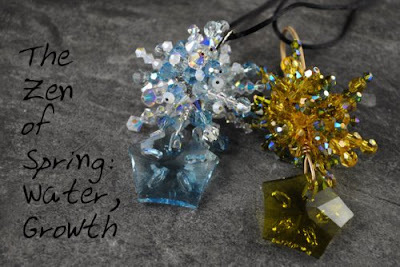 An explosive celebration of new life created with crystals adorns each one. The Make and Takes are only $10 - and include the kits! The kits are donated, and all the proceeds are going to the local Tucson YWCA. Spaces are extremely limited, so sign up soon! Do you need any more reasons to escape the winter and fly south? Ok - here's one more reason. Because you don't have an all-over fur-coat and built-in four-paw drive. 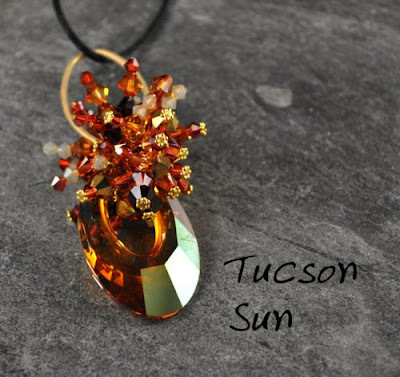 The Crystal Explosion Pendants will be presented on Tuesday, February 1 at 11 am, 12:15 am, 2:00 pm and 3:15 pm in Tucson. We're Back! School is now in Session.